Aristolochia macroura is native to the Rio de Janeiro area of Brazil. Aristolochia macroura has a fabulous long tail on each flower. Aristolochia macroura is a host plant for the caterpillars of the Fluminense Swallowtail. The native habitat is sandy and much of the plant material is shrub height. 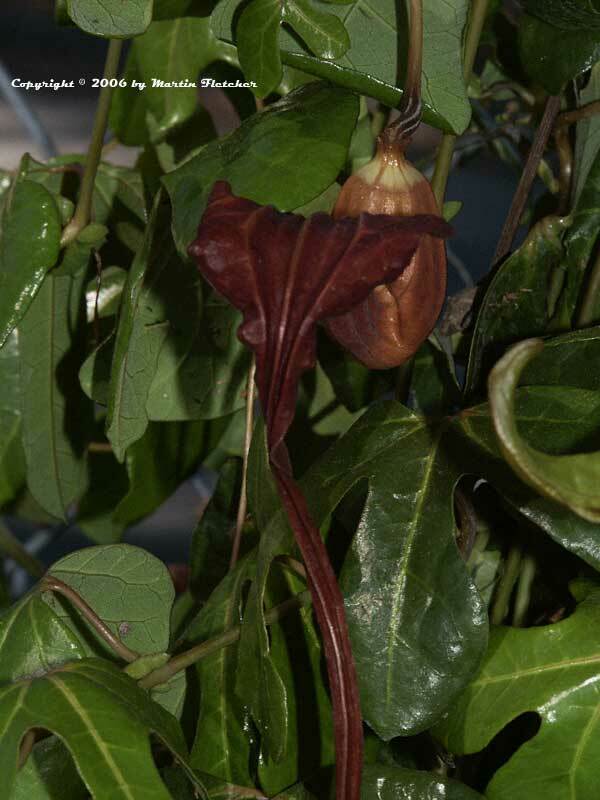 As you can imagine plants faced with our winters struggle coming from a climate where temperatures rarely dip below 60° F. Aristolochia macroura is poisonous if ingested. Treated as an annual, or containered and taken in for the winter Aristolochia macroura is spectacular in bloom. This Dutchman's Pipe will attract the Pipevine Swallowtail to your Butterfly Garden. Flowers and foliage of Aristolochia macroura the a Dutchman's Pipe relative. High resolution photos are part of our garden image collection.